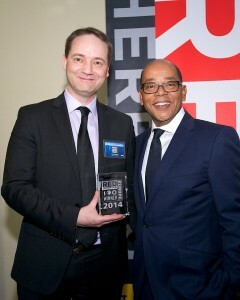 Laurent Tonnelier, mobiLead CEO, with Alex Vieux at 2014 Red Herring 100 Europe award ceremony in Amsterdam. The Internet of Things (IoT) is coming for ordinary objects. By 2020, the market will count 26 billion units installed, while product and service suppliers will drive more than $300 billion in incremental revenue, Gartner gauges. A more connected world will also involve the use of QR Codes, tags that can be scanned and that lead to websites in order to deliver information to end users. It will likely leverage the use of Near Field Communication (NFC), which enables devices to talk to each other by way of radio technology. Juniper Research put the worldwide NFC market swelling to $110 billion by 2017. Companies able to connect offline products to an online world face an enormous opportunity. At its core, mobiLead as a company aids customers in finding out more about products. CEO Laurent Tonnelier notes a worldwide push for brands to provide information via increasingly small spaces on packaging. One solution: QR Codes from mobiLead, which fit in the space between companies holding answers and customers with questions. mobiLead teamed up with the International Organization for Standardization to ensure its codes were compliant with technical rules; they are guaranteed to work with any reader. Importantly, the company satisfies requirements from four camps: those that want an image that looks good, those that need it perform perfectly, those that demand the code be unique and leverage a onetoone relationship, and those that call for the company to help with code management after all is said and done. That last pole supporting mobiLead’s offering –– its ability to help companies keep track of links after a code goes out –– sets it apart from its most major competitor. Some companies solely works in blackandwhite QR, he says, and doesn’t manage the link. Meanwhile, mobiLead puts IDs within a URL that can be handled by the brand, he goes on. It also ensures that IDs stay secure. The market around mobiLead is massive, as the company sits at the crossroads of three major segments: QR, NFC and the burgeoning opportunity that is Internet of Things. “The market is each and every consumer packaged good,” Tonnelier says. The company began by targeting big brands, then the agencies serving those brands, and then machine manufacturers. Tonnelier started the company after working with Oracle and noticing the need for an easy way to get to content. Two methods proved more convenient for users than typing URLs with long strings of letters and numbers: one by way of scanning a QR Code to access content and the other using NFC, which involved programming and coding something to a chipset using radio wave, says Tonnelier. The company has not received venture capital, relying instead on its own revenue to power growth. Now, it will look to raise money. The main challenge ahead for mobiLead will be fortifying sales on a global scale, which will require investment. “What we want to achieve is mainly an OEM model in which the software runs pretty much everywhere,” Tonnelier says. “Imagine that each printing machine has a software. 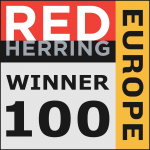 Our software.” The company follows the philosophy: Act local, think global. It teams with the ISO and W3C (the World Wide Web Consortium) to ensure that its business correlates with its international ambitions. The company also works with enterprises that leverage international reaches. The Internet of Things will ensure that the world gets smaller and more connected, delivering data to people when and where they need it. But content is only as good as a consumer’s ability to get to it. From France, mobiLead helps these customers access information, taking QR Codes from ugly to lovely in the process.